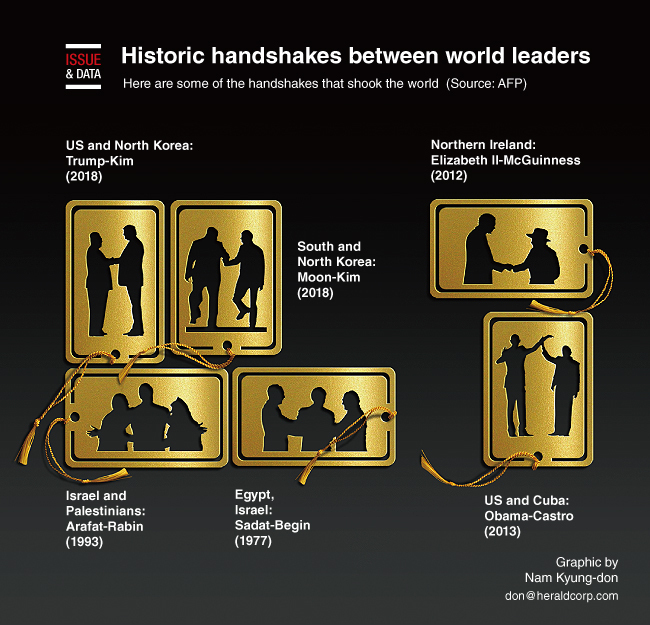 US President Donald Trump’s handshake with North Korean leader Kim Jong-un in Singapore on Tuesday marked a historic moment -- the first meeting ever between a sitting US president and the leader of North Korea. The extraordinary encounter saw the leader of the world’s most powerful democracy shake hands with the third-generation scion of a dynastic dictatorship, standing as equals in front of their nations’ flags. On April 27, 2018, as the world held its breath, Kim Jong-un and South Korean President Moon Jae-in reached across the Military Demarcation Line that divides the two Koreas and shook hands, the result of a remarkable thaw on the peninsula sparked by the Winter Olympics earlier in the year. The two leaders agreed to pursue permanent peace and the complete denuclearization of the divided Korean Peninsula. At a memorial service for Nelson Mandela on Dec. 10, 2013, US President Barack Obama made headlines when he shook hands with Cuba’s Raul Castro, the first such public greeting between leaders of the bitter neighbors after decades of enmity. Obama visited Cuba in 2016 -- the first such trip by an American president in 88 years. Then a deputy first minister of Northern Ireland, McGuinness shook hands with the queen during her June 27, 2012 visit to the province. It was a gesture toward reconciliation that would once have been unimaginable, with McGuinness’ militant past and British security operations still a source of anger for many. After months of secret negotiations in Norway, Israeli Prime Minister Yitzhak Rabin and Palestinian leader Yasser Arafat stood in the South Lawn of the White House on Sept. 13, 1993 to witness the signing of the Oslo Accords. In what is widely considered a major turning point in the recent history of the Middle East, Egyptian President Anwar Sadat arrived in Israel on Nov. 19, 1977 on a historic visit -- the first by an Arab head of state to the Jewish nation. Sadat paid for it with his life: He was assassinated by Islamists in 1981.